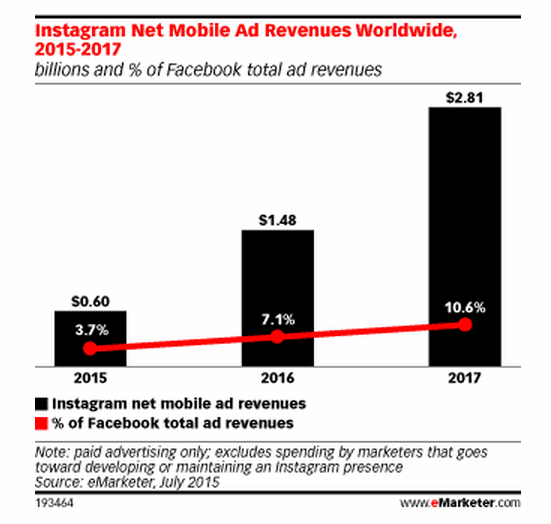 Instagram will bring in $595 million in mobile ad revenues worldwide this year, according to a research conducted by eMarketer’s first-ever advertising forecast.In just two years, Instagram’s global mobile ad revenues will knock $2.81 billion that is 10% of Facebook’s estimated global ad revenues that year. This year, Instagram’s revenues will account for 3.7% of Facebook’s total ad revenues. The figure will climb to $1.48 billion, or 7.1% of Facebook’s total ad revenues, by 2016 and $2.81 billion or 10.6% of its parent company Facebook by 2017. Instagram has been gaining its popularity among its users since its inception and some new features aimed at enticing advertisers approaching on the horizon could make it even more popular, according to eMarketer’s report. The overwhelming majority around 95% of Instagram’s ad dollars are made in US, according to eMarketer. The US is the place where the app has highestuser base of around 64.2 million and eMarketer predicts that the number will rise to 111.6 million by 2019. The current user base increased from the last year by 60% in 2014 to touch 64 million. 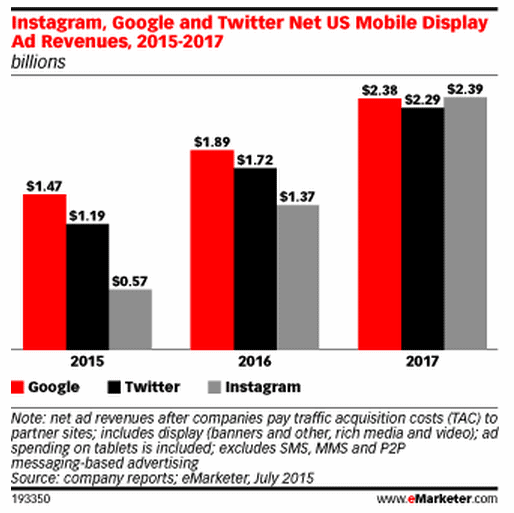 In a sign of just how quickly Instagram is expected to grow in US, eMarketer forecasts that it will have higher net mobile display ad revenues than both Google and Twitter in 2017. Last year, Instagram surpassed Twitter to become the second-largest social network platform in US. Twitter’s US user base grew 12.1% in 2014 to reach 48.4 million users.